By February the winter can feel at it’s longest and possible it’s gloomiest with still short days and the leaden skies of possibly the coldest month. A splash of, knock you between the eyes colour is just what your garden needs to help lift your spirits. A lot of winter flowering shrubs are delicate and scented with much to commend them, but the vivid colour of the winter berries packs a strong punch. Here are some plants well worth adding to any winter planting. Iris foetidissima: This iris is as tough as old boots and will seed about freely in any dry soil, it will cope well with thin chalk soils and semi-shade to dense shade. It makes thick clumps of mid-green leaves, which gently arch. It has small and frankly rather unimpressive white and creamy flowers. It is of course the berries that are the star turn, the ride fruit capsule opens in three segments to reveal row upon row of bright orange berries, these last well into late winter and will brighten any shady stop at a low level. Pernettya mucronata ‘Bell’s seedling’: This low growing evergreen shrub makes dense sweeps of ground cover. With upright stems up to 50/70cm tall, with small dark green almost pricakly leaves. It has small insignificant white flowers early autumn followed by the most amazing berries. Which are round large pink berries that look like tempting gob-stopper sweets, which last nearly all winter. Bell’s seedling, is self-fertile but it will produce more berries if it is planted in a mixed group with male forms, P. mucronata ‘Mascula’. Grow in full sun to get the best berries although they will tolerate a little dappled shade. They need a good acidic humus rich soil with good levels of moisture but not water logging. Symphoricarpos rivularis: The ‘Snowberry’ loved and hated it seems in equal measure, but perhaps it is just not used to the best effect in most gardens. A deciduous shrub with arching stems up to 1.2/ 1.3m tall, it will tolerate dry shade but will berry much more freely if in a sunnier spot. 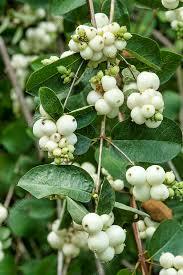 The small round green leaves, fall and give way to clumps of white berries borne along the upper reaches of the stems. There is also a pink form. It looks at it’s most striking planted with an evergreen backing like a yew hedge, so the almost opayic white berries glisten against the dark back ground. It does tend to sucker so it needs to be kept in check. 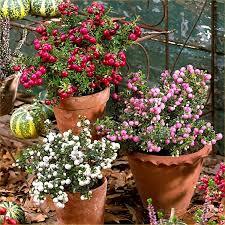 It will cope with both very dry soils to heavy soils and will tolerate shade although the berrying is much reduced. 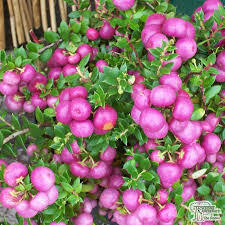 Gaultheria mucronata ‘procumbens’: Beloved by the winter bedding sellers and popping up in pots and tubs outside pubs and in mixed plantings of winter flowering pansies, this versatile shrub is much more then a one trick wonder to be stuffed into a pot as a temporary bit of bedding. It makes a good dense creeping ground cover with dark green leaves. It grows in dry and dense shade so can be invaluable as under planting at the foot of mature trees. It needs acid soil. 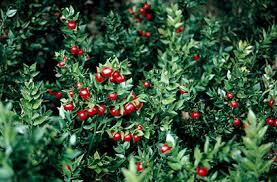 Tiny white flowers are followed by large ‘cherry’ like fruits of shiny red berries which look good enough to eat. But don’t be tempted as all parts of this plant are poisonous. Ruscus aculeatus: ‘Butcher broom’ A native low growing evergreen shrub with upright stems of small dark green leaves, With spiny tipped stems. 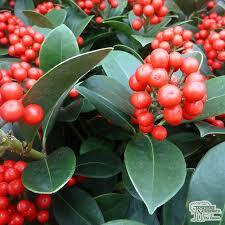 Small bright red berries are held along the stems from September through the winter. It grows well on shallow chalk and will cope with dry shade. 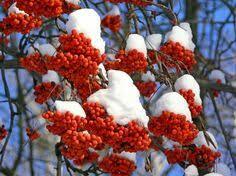 To get the very best out of the winter colour these plants offer, they need to be carefully sited, either close to paths, near back doors, or the route to the garage, shed or log store or planted with an evergreen backing so the berry colour really stands out and can be easily seen. 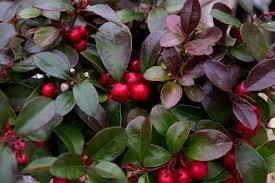 I hope you feel inspired to look again at planting bright berry colour that lasts beyond the autumn months. If you want help extending the planting colour in your garden to include the Autumn, Winter and early Spring, I know just the person to help you. 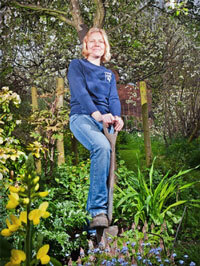 Give me, Emily a ring Tel;01273 470753, or contact me through the contacts page of my web site, to discuss your garden project and your planting needs. This entry was posted in Gardening Thoughts, Gardening Tips on February 5, 2019 by Emily. Bare Root and Root Balled Planting Season. Shelter Belts and Tall Hedges.